REGIONAL NEWS - AFRICA 20 E&MJ • NOVEMBER 2017 www.e-mj.com Randgold Prepares to Complete Kibali Underground Mine in the DRC The Kibali gold mine remains on track to achieve its production target of 610,000 ounces (oz) this year as its underground operations, and the integration and auto- mation of the vertical shaft enters the fi- nal commissioning and automation stage, according to Randgold Resources CEO Mark Bristow. The mine is anticipating a significant increase in production once the final shaft commissioning, which remains on a tight schedule, has been completed. At a briefing for local media, Bristow said in spite of the high level of activity at the mine, there had been a significant improvement in the safety statistics, with its total injury frequency rate continuing to decrease and lost time injury frequen- cy rate down to 0.31 per million hours worked in the September quarter. Following the anticipated completion of the underground mine in the fourth quarter, the only major capital project still in the works would be Kibali's third new hydropower station, currently being constructed by an all-Congolese contract- ing team. Bristow said the availability of self-generated hydropower and the mine's high degree of mechanization and automa- tion were important factors in Kibali's abil- ity to sustain its profitability throughout the ups and downs of the gold price cycle. To date, more than $2 billion has been spent on acquiring and developing Kiba- li. "With capital expenditure tapering off, Kibali should now be preparing to pay back the loans taken to fund its develop- ment," Bristow said. "We are concerned, however, that its ability to do so will be impeded by the increasing amount of debt — currently standing at more than $200 million — owed to the mine by the govern- ment. TVA refunds, excess taxes and roy- alties in violation of the country's mining code, make up the bulk of this amount." Another troubling development was the recent reintroduction by the Ministry of Mines of a proposed new mining code, which is exactly the same as the one the government withdrew in 2015 after it was demonstrated that it would serious- ly damage or even destroy the Congolese mining industry. Kibali spent approximately $40 mil- lion with Congolese contractors in the past three months alone, Bristow ex- plained. "The DRC has all the materials for building a sustainable mining industry but that will require a fully committed partnership between the government on the one hand and the mining companies on the other," Bristow said. 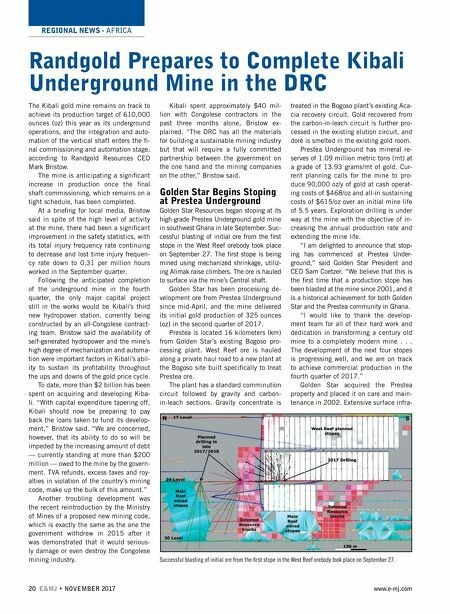 Golden Star Begins Stoping at Prestea Underground Golden Star Resources began stoping at its high-grade Prestea Underground gold mine in southwest Ghana in late September. Suc- cessful blasting of initial ore from the first stope in the West Reef orebody took place on September 27. The first stope is being mined using mechanized shrinkage, utiliz- ing Alimak raise climbers. The ore is hauled to surface via the mine's Central shaft. Golden Star has been processing de- velopment ore from Prestea Underground since mid-April, and the mine delivered its initial gold production of 325 ounces (oz) in the second quarter of 2017. Prestea is located 16 kilometers (km) from Golden Star's existing Bogoso pro- cessing plant. West Reef ore is hauled along a private haul road to a new plant at the Bogoso site built specifically to treat Prestea ore. The plant has a standard comminution circuit followed by gravity and carbon- in-leach sections. Gravity concentrate is treated in the Bogoso plant's existing Aca- cia recovery circuit. Gold recovered from the carbon-in-leach circuit is further pro- cessed in the existing elution circuit, and doré is smelted in the existing gold room. Prestea Underground has mineral re- serves of 1.09 million metric tons (mt) at a grade of 13.93 grams/mt of gold. Cur- rent planning calls for the mine to pro- duce 90,000 oz/y of gold at cash operat- ing costs of $468/oz and all-in sustaining costs of $615/oz over an initial mine life of 5.5 years. Exploration drilling is under way at the mine with the objective of in- creasing the annual production rate and extending the mine life. "I am delighted to announce that stop- ing has commenced at Prestea Under- ground," said Golden Star President and CEO Sam Coetzer. "We believe that this is the first time that a production stope has been blasted at the mine since 2001, and it is a historical achievement for both Golden Star and the Prestea community in Ghana. 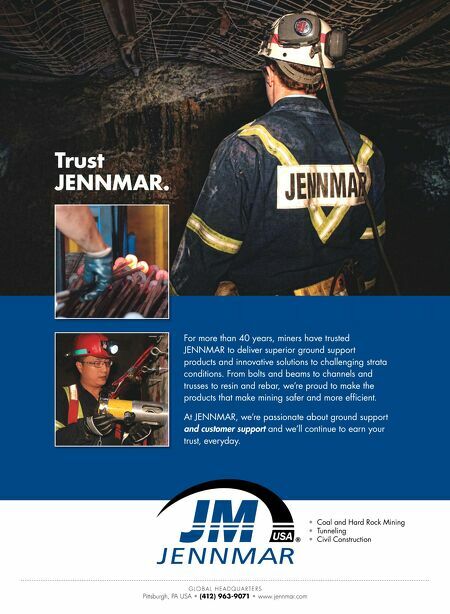 "I would like to thank the develop- ment team for all of their hard work and dedication in transforming a century old mine to a completely modern mine . . . The development of the next four stopes is progressing well, and we are on track to achieve commercial production in the fourth quarter of 2017." Golden Star acquired the Prestea property and placed it on care and main - tenance in 2002. Extensive surface infra- Successful blasting of initial ore from the fi rst stope in the West Reef orebody took place on September 27.